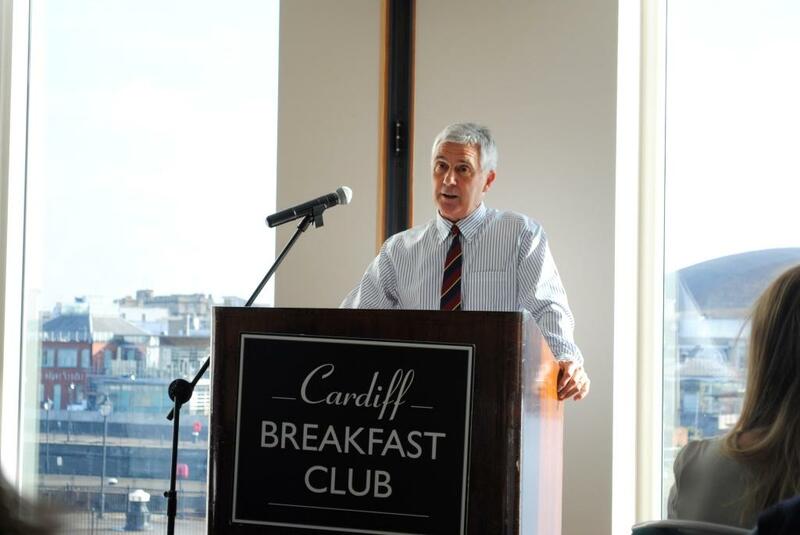 We were lucky enough to have been joined by Gareth Davies, Chairman of the Welsh Rugby Union (WRU) as the speaker for this month’s Breakfast Club. An ex British Lion and Captain of Wales, Gareth has an illustrious sporting background as well as a strong professional and business record, and has previously held the position of Chairman of the Sports Council for Wales and Commissioning Editor for Sports and Events at S4C. Gareth began his presentation by explaining that one of his first priorities when becoming Chairman of the WRU was to develop ‘greater unity’ within the organisation. In order to achieve this, Gareth is committed to making the Union more open and transparent, and improving communication between all levels, from club to elite. Gareth believes that as the elite level is very successful, the WRU needs to concentrate on creating a strong grassroots foundation in order to develop players for the future. One of the projects currently underway in this area is the School Club Hub Initiative. The WRU has been working with 43 schools across Wales to establish Rugby Development Officers in each school. The project, which is half funded by the WRU and half by the schools, has been hugely successful, with the number of schools involved set to double in September. Gareth also discussed some of the issues surrounding the Millennium Stadium as an asset of the WRU. Now 15 years old, the ongoing maintenance costs are extensive, with the current priority being the need for all the Stadium seats to be replaced over the next few years, an enterprise which will cost the Union £4/5 million. The WRU are also looking to expand the footprint of the Stadium, and Gareth is looking forward to the Stadium hosting 8 matches for the upcoming World Cup as a key opportunity for the Stadium to be exhibited to the world. 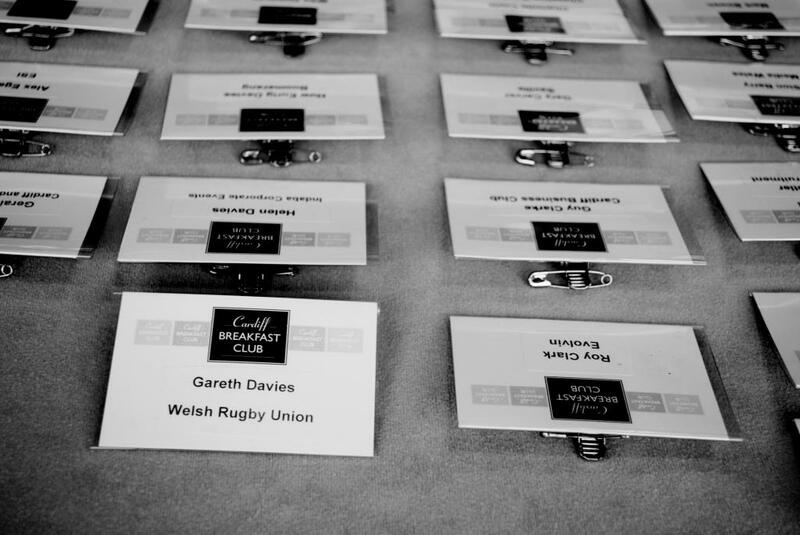 Gareth concluded his presentation by highlighting some of the changes to the WRU Board itself. The Union has recently appointed two new non-exec directors and for the first time ever, its first female board member. Gareth also explained that they are looking to bring in more outside expertise and have created a special advisory board of 5 individuals from worldwide businesses who can use their business knowledge to advise the WRU on particular projects. 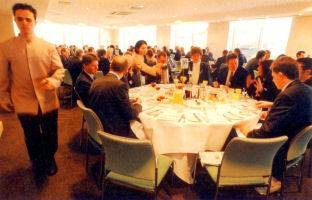 The next Breakfast Club will be held on 18th June with guest speaker Simon Powell, CEO of Eysys. For further information and booking details, please contact susannah@petersenspr.com or phone 02920 549597. 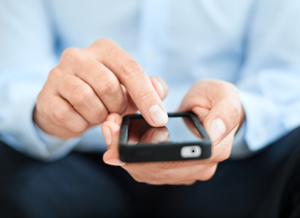 Have we as consumers become ‘cocooned’ in our own mobile worlds? It struck me on the train to and from London yesterday as well as travelling on the underground that so many of us, especially the younger generation, rely so much upon our mobiles. 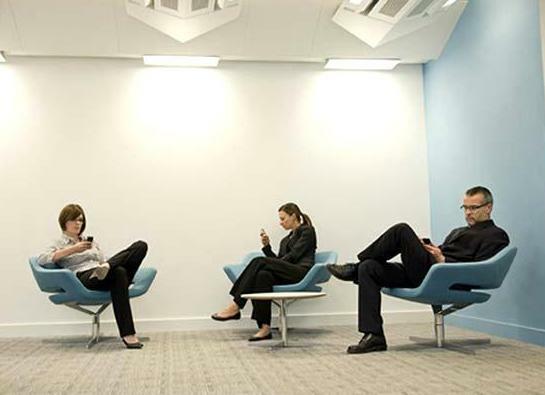 'Cocooned' consumers: Are we becoming too dependent on our mobiles? It was refreshing to arrive at a reception in the magnificent Merchant Taylor’s Hall in Threadneedle Street before the annual NCWE Awards ceremony to actually mingle and talk face to face with people, communicating with body language, eye movement, gestures, as well as listening and waiting before answering questions. It was a delight to engage with Nikki and Hannah from Holiday Extras, one of the NCWE sponsors, who told me more about their organisation and themselves that I would have gathered from their company’s website. Network failure: a multifaceted approach to communication is vital. So while it appears there is no stopping the rise of digital promotion, marketers should remember that as research from the Consumer Knowledge Centre says, “the cocooned consumer is looking to brands for resonance, nurturing, and genuineness; brands must offer support and transparency.” I doubt that this can be done solely in messages of 140 characters. The case for a multifaceted approach to campaigns is vital in both the short and long term for all advertisers. Thank goodness, otherwise I would have to admit defeat and never step out of my front door, do all my networking, and communicate by iPhone, emails, etc. I would save a lot on clothes, cleaning offices and in other areas, but would miss the social interaction and genuine enjoyments of meeting people face to face. We are delighted that Robert Huggins has chosen the Breakfast Club as the platform to launch his latest research into Culture and the Economy. Using Wales as a case study he analyses the extent to which community and business cultures differ across the localities of Wales and between Wales and other regions and nations. This has significant implications for economic development and we will be able to see what the impact is upon Cardiff. Having previously lectured at the University of Sheffield and UWIC, Professor Huggins was appointed as Chair of Economic Geography at Cardiff University and Director of its Centre for Advanced Studies in September 2011. His key areas of research include the study of competitiveness, innovation, culture, and economic development. He acts as a policy advisor and consultant to a range of organizations, and is committed to furthering research that informs corporate strategy and public policy. The next Club Meeting will be held on Thursday 29th September 2011 at The St. David’s Hotel & Spa, Cardiff Bay. As usual, we will commence at 7.45am and finish by 9.15am. Breakfast will be served promptly at 8.00am. We would be delighted if you were able to join us. If you wish to attend, please email Becci Gould, Account Executive on bec@petersensone.com no later than Tuesday 27th September 2011. Please note, any seating requests should be made clear at time of booking. 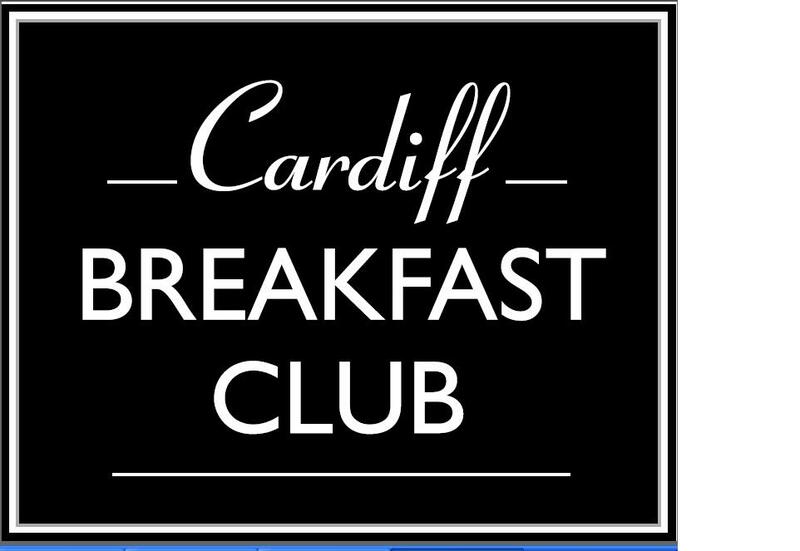 The Cardiff Breakfast Club regrets there can be no refunds should you cancel after Tuesday 27th September 2011. Should you be unable to attend, a substitute is welcome at no extra charge. Please also note that the next event for your diaries will be held on Wednesday 19th October with guest speaker Lt Colonel David Wheeler, 2 R Welsh.